Garret Freymann-Weyr (née Weyr) was born and raised in New York City. She inexplicably went to college in North Carolina (UNC-Chapel Hill) and, just as inexplicably, got an MFA in film (NYU). She now lives outside Washington, D.C. with her husband. She has written five books for young adults, one of which, somewhat inexplicably, won a Printz honor. Her work has been sold to countries including the Netherlands, Germany, Japan, and China. Her next book, French Ducks in Venice, is a picture book for a younger audience. 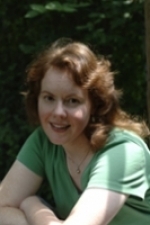 You can find out more about Garret Freymann-Weyr at her website. 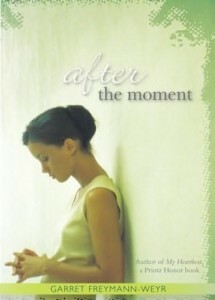 After the Moment is a novel about boys, love, and violence. Leigh Hunter and Maia Morland meet at a dinner party four years after their high school romance ended in bloodshed, legal charges, and parental meddling. During the party, Leigh remembers how and why he fell in love with Maia, who liked to describe herself as an anorexic, self-cutting “train-wreck”. The novel explores how love transforms us, and how failing to meet its complicated demands helps to shape the adults both Leigh and Maia become.